I’m all for modern kitchens, but sometimes something different makes all the difference. So if you prefer something a little more vintage instead of modern, these appliances are for you. There’s something about vintage style that can’t be defined and yet it’s there. 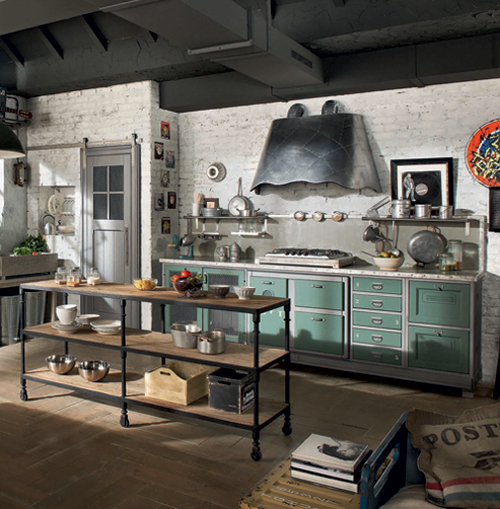 Just take a look at these ideas from Marchi Group related to vintage kitchens. Gas cookers were invented in the first decade of the nine-teenth century but were not in general use until 1850. At firs tthey were regarded with great suspicion  people fearedexplosions, poisoning or food tasting of gas. 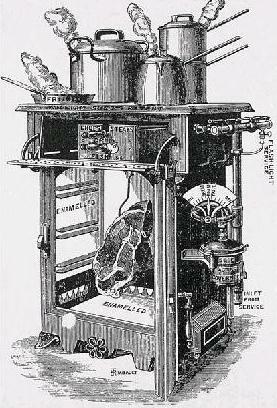 To begin withthey were used in hotels and institutions, but it was not until 1924 that an oven regulator or thermostat appeared which made possible, for the first time, the accurate control of the temperature of the oven. The other great advantage was thatthe gas cooker did not need a flue, so could be placed anywhere within a room, even in a room without a fireplace. 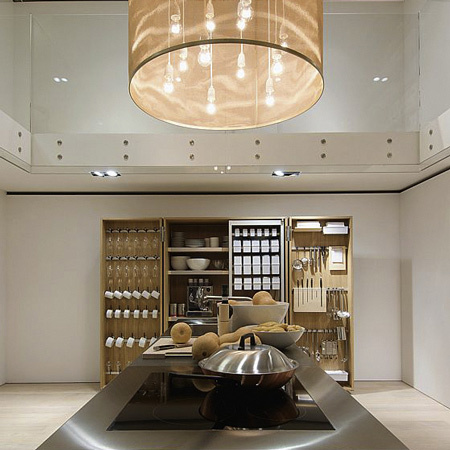 With the b2 kitchen workshop, 1German kitchen manufacturer bulthaup has radically rethought the concept of the kitchen. Starting from the origins of every living space – fire and water – the company has created an open and mobile kitchen that can be added to and composed to suit each individual’s personal requirements. The new group of elements is the logical continuation of the kitchen workbench and defines the “kitchen workshop” in its original meaning – comprising a workbench, kitchen tool cabinet and appliance housing cabinet. The three main elements: a ‘workbench’ housing the sink and cooker, ‘tool cabinet’ for utensils, crockery and food, and appliance cabinet for the oven, dishwasher and fridge. 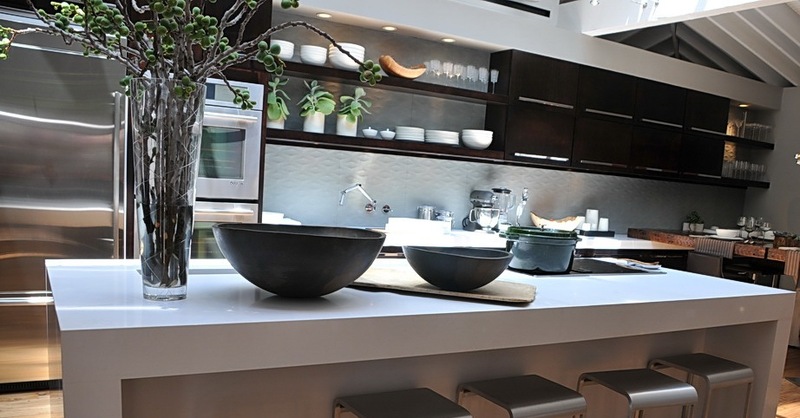 As the new approaches, I have put together a list of a few kitchen remodeling trends that are in store for 2012. Let’s see the design, appliances, colors and lighting I think will be popular next year! The Isola kitchen is entirely made of steel which – besides being beautiful (if a bit difficult to keep clean off fingerprints) – makes its sleek shape possible. 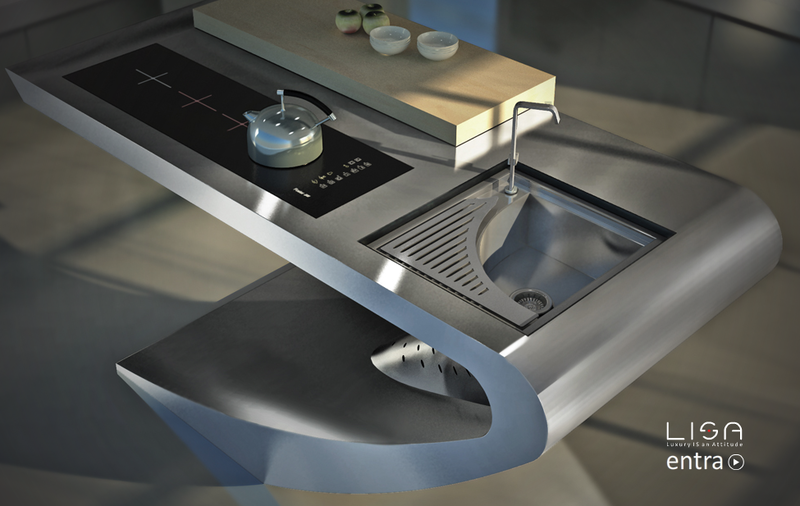 The Isola kitchen has a cooktop, some work-surface and a sink built in and comes with a matching hood. Where would you put this? 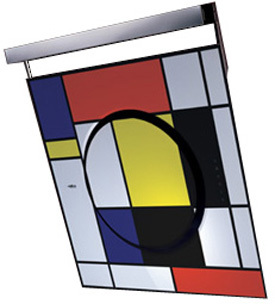 Surely not next to a wall, this piece of furniture (shall I say art?) is made to be on display. Also, you’ll need a quite sizeable kitchen for it to look best. It might not have the practical tidbits (like, er….. drawers?) its more boxy counterparts do, but if you have the kitchen this piece of furniture fits into, this is probably the last thing to worry about. First, let me wish a happy new year for you, dear reader! And now, I think it’s time for the ‘obligatory’ trends post, as the new year starts – we all need to start from somewhere, don’t we? You usually build your kitchen to last for quite a few years, however if you’re like me, you also try to get inspiration from several sources and keep on top of the latest and greatest. Trends in kitchen design are sometimes considered temporary fads, appearing one day, passing the next. However, if you look deeper, there are trends that are consistent, quite some of them are here to stay. Pot racks are used to be part of every kitchen. Do they have a place in a modern one? There’s something unusual about pot racks in a kitchen. They probably went out of fashion quite a while ago (at least regarding ‘mainstream’ kitchens) However, many modern kitchens I see in catalogs often seem sterile and you’d never know whether anyone did ever cook anything there. But whenever I see a kitchen with a pot rack, it suggests to me that this is a real kitchen…where people cook, eat, gather. It makes the kitchen space feel used, living, sizzling with fresh food. 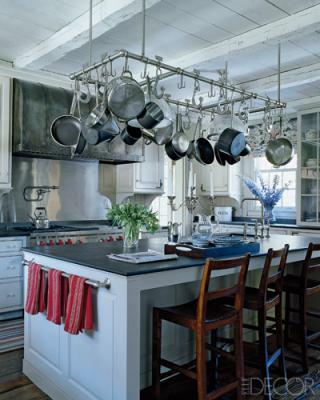 Pot racks are a beautiful way to showcase your cookware, especially if you have a beautiful collection. And besides being a decorative element, pot racks are also quite functional. You know, it should be big enough, with an island or two, all the cupboards you need, task- accent- and food-tracing lighting, all that glitz and useful mechanics… You think great stone or walnut floor, big-big windows and ample workspace. Space to entertain, to cook, to store, whatnot. I was recently in the market for a new hood. I was looking for something modern – stainless steel or glass or something like that – here’s what I’ve found. My current favorite is the OM from Italian company Elica. (they are sold in the US through Zephyr as far as I know) It easily might be the most fancy hood ever made with its striking glass surface and touch-controls. It’s available in red, black and white and apparently has two types of remote controls. The best part besides the looks is the remote control which does not have a button at all. just place the control on a flat surface – rotate clockwise to increase fan speed, counterclockwise to decrease. 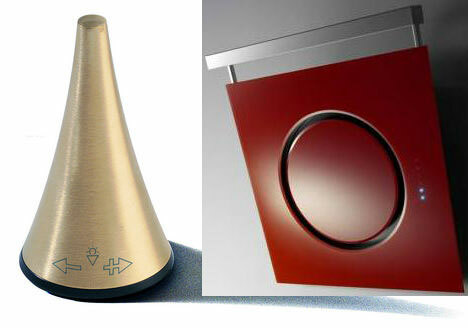 To control the lighting of the vent-hood, simply tap the remote control. As for the parameters, it’s 80 cm or 31.5″ wide and tall. 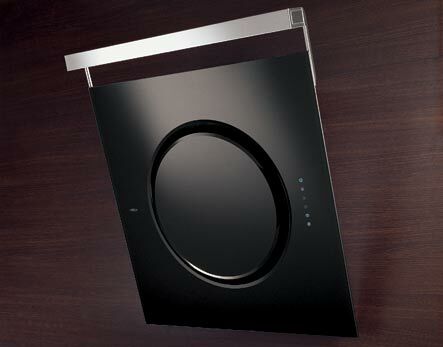 However quite large (for my kitchen, anyway) it atcually saves space thanks to its almost vertical placement. Airflow is 450 cubic meters per hour. What is the most dangerous part of your home?